As digital marketing innovators, we are dedicated to leading our peers and other marketing specialists into the future, whether through lectures, conferences, or published and downloadable materials. Join us this October as we participate in a digital marketing conference that will give you insights to search marketing. SEMCON 2013 will take place at the Hotel Intercontinental in Makati City on October 30-31, 2013. Our very own managing director, Clayton Wood, will be the first speaker of the event. In his speech entitled “Think Content Marketing! Earning Visibility and Links through Killer Content,” you will learn how to use content as a marketing tool and how to develop a strategy that effectively gets you fresh new leads, online visibility, and goal conversions. 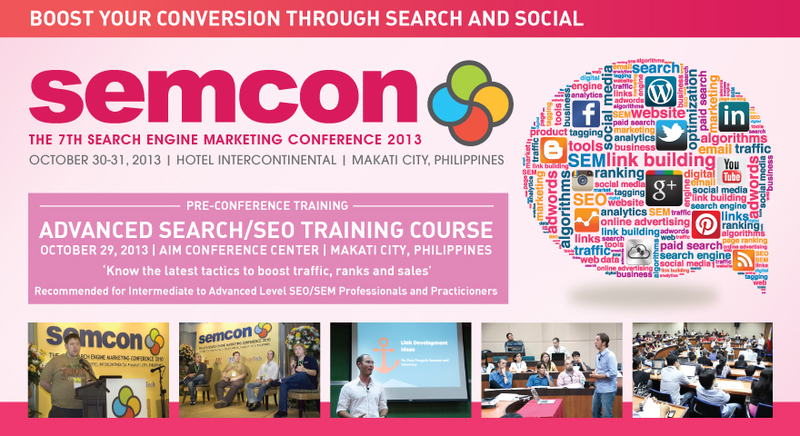 The 7th SEMCON 2013 is a 2-day event that will take place at the Hotel Intercontinental in Makati City. The event features sixteen speakers specializing in different areas of online marketing who have prepared presentations related to this year’s theme. You can register for the conference at the event’s official website. We’d be happy to answer any questions you may have regarding your current search engine optimization strategy. Talk to us today and we’ll help you learn more about online marketing and help you get started on creating an effective marketing plan for your business.